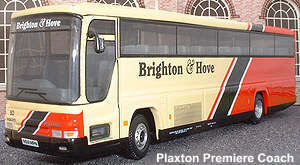 The Plaxton Premiere and Excalibur replaced the long running Paramount series in the early 1990's and remained in production until 2002 when the new Paragon & Panther coach bodies were introduced by Plaxton. 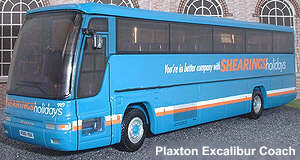 The Premiere found favour with both major and independent operators across the UK and could be fitted to various chassis including those produced by Dennis, Scania, DAF and Volvo, the higher spec Excalibur model with its pronounced raked windscreen sold in smaller numbers being used mainly for higher profile tours and express services. The OOC models were introduced into the range in 1998, initially the two versions were given sperate series 433 for the Premiere and 438 for the Excalibur, following the introduction of the OM numbering series in 2001 both versions are now issued in the OM433 series. The Premiere version has been the most issued to date echoing its popularity over the Excalibur among operators. Models of the replacement Paragon & Panther coaches were added to the OOC range in 2007.